Playing store goes virtual with this app. 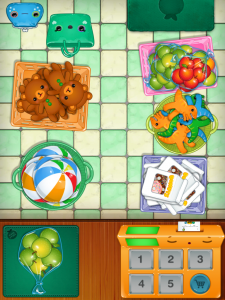 The easy interface and bright, cheery graphics are characteristic of the Toca Boca apps. Once you get the hang of it, the game is clearly intended for the 4+ crowd. If you’ve ever found yourself paying eleventy dollars for the family dog, who incidentally was being sold by your smooth-talking four-year-old, then you have participated in the age-old tradition of “playing store”. 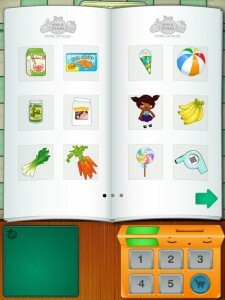 Toca Store takes this childhood rite and brings it, in typical Toca Boca fashion, to your child’s fingertips. 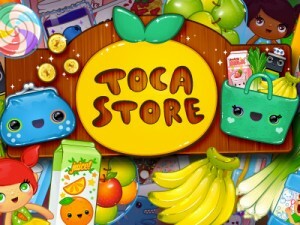 Opening the app brings me to a brightly colored store front aptly named “Toca Store”. In the window hangs everything from bananas to robots, promising a variety of items that would make even Sam Walton proud. This is where it got tricky for me: Even after watching the YouTube trailer and reading the parents’ letter I still couldn’t figure out where to start. After some trial and error I discovered that I needed to start with stocking the five baskets that each held what was clearly marked as the store’s catalog. Once my baskets were brimming with cheese, robots, beach balls, fish sticks, and tool sets, I was stumped again until I dragged a ball over to the check out counter near next to the register. The numbers on the register lit up and I was excited to find that I could set the price of each item myself. A small animated coin purse bounced excitedly and I had to drag the appropriate number of coins and drop them in the drawer. This process continued until my coin purse was empty and my shopping bag was full. My transaction was complete and I was presented with a receipt that clearly showed my purchases and the total I spent. Layout is such that it’s visually conducive to having one player on each end of the iPad as the checkout counter is directly facing the “customer” (see pics). Not only does this encourage verbal interaction but it also allows children to use heir own imagination while playing. This is a great app to teach the younger players all about capitalism and consumerism. I kid – it’s actually a great tool for early-learning math skills, particularly addition and subtraction; especially because there are no large numbers used. In their parents’ letter the developers suggest different discussion points beyond addressing the basic math skills. For example, how could the items’ pricesaffect customer’s purchases? Which items work together to make a sensible purchase? What exactly do you plan on making with fish sticks, bananas, and a kazoo? 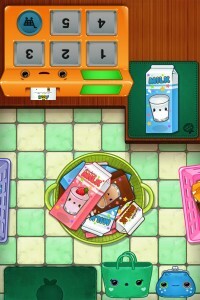 Players can take all the time they need to shop because there are no time limits in the Toca Store. No background music means no distractions from the haggling process. This app is worth $1.99, especially when you find out how creative a four-year old can actually get with fish sticks, bananas, and a kazoo. The family dog will thank you.